Mental health is frequently sidelined in humanitarian aid because of the focus on immediate needs. However, psychological issues can have an impact on many aspects of a displaced person’s life, from their ability to seek employment to their family and even physical health. We have to advocate for a stronger focus on psychological support in humanitarian aid. How can aid workers and volunteers offer support while acknowledging the limits of their knowhow and resilience? What is currently lacking in mental health provision for asylum seekers in Greece? Humanity Crew was our main speaker, bringing their expertise in the provision of first response mental health to refugees and longer term treatment. We also had interventions of many organizations who provided their experience directly from the field on the subject. From the discussion, it became apparent that while there are growing calls for psychological support to be given more time and focus in aid, putting that in practice can be delicate. There are many reasons why refugees and asylum seekers would not access or ask for mental health support. Cultural barriers: They were frequently mentioned during the discussion as one of the reason that would stop someone from seeking or accepting treatment. It is true that mental health carries a stigma in Middle Eastern culture that can make it difficult to bring up in conversation, especially when the recommendation is to see a psychologist. However, Yara from Humanity Crew highlighted the importance of looking at cultural context as a prism rather than a barrier. It is about understanding the perspective of the person you are talking too, rather than assuming their beliefs, feelings or position. Example: In the case of domestic abuse, it is not sufficient to only provide support and empowerment for the female victim. Given the importance of the man’s role as provider in countries of origin, men in an asylum seeking situation may often feel diminished. They should also be provided with access to psychological support and regaining their sense of worth. Lack or loss of trust: Smaller organisations often see themselves making referrals, especially when the organisation itself does not provide mental health services. The person doing the referrals has the trust of the patient and acts as a guarantee towards the next step. Ensuring a follow up and checking that the person referred feels comfortable with the new organisation or person is key in ensuring that people do not just drop out and lose access to valuable support. For any organisation, whether they provide mental health services or not, the importance of creating safe spaces and building a community around displaced people was frequently repeated. Both of these can make it more easier for people to ask for help but also to manage outbursts and crises. 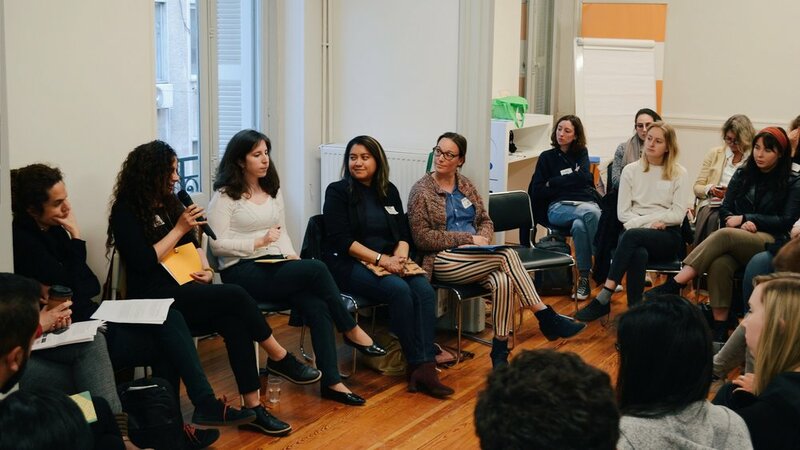 CHEERing International, an organisation focusing on the needs of pregnant women and new mothers, brought up how the trust and connection they build with mothers through breastfeeding workshops can open up discussions about mental health. Similarly, Hestia Hellas, an organisation running a community center in Central Athens, has seen firsthand how a place that people can come when in need of support creates that trust. Small number of specialised services: A small number of organisations, citizen-led or INGOs providing mental health support exist whether in the islands or the mainland, to newcomers or long-term applicants. Unequal support for distinct groups: It has been noticed that there are less Urdu and Farsi interpreters ( which are a total need ) than Arabic interpreter. Limits of the overstretched Greek mental health system: It is difficult to access support beyond the humanitarian community due to bureaucracy and the limited availability of services overall in Greece. Additionally, treating trauma and PTSD, especially for people having experienced conflict, is not an expertise that can be found easily in Greece. Velos Youth has done an extensive mapping of services they can refer the young people they work with to and it is getting increasingly difficult to get support. One way to alleviate the pressure, is through initiatives that go beyond more traditional mental health services. This can be a service that specifically focuses on mental wellbeing, such as dramatherapy or breathwork. Breathwork International talked about the importance of breathwork in dealing with trauma and how it can become a daily tool for people to work through painful emotion. However, many activities can have an impact on the wellbeing of people by creating a space for self-expression, socialising and healing. Free Movement Skateboarding explained how they realised that their skateboarding sessions were boosting self-esteem and giving a sense of belonging, of having a role. You often fell down but by getting up every time you develop resilience. Discovering the city through skating can also be very empowering for young people building a new life in Athens. Finally, the most important factors in providing mental health are the knowhow and self-awareness of the aid workers themselves. Lack of relevant knowledge or training by the organisation: Mental health issues can be overlooked because depression and trauma often express themselves through violence, aggression or substance abuse, especially in men, or disruptive behaviour in children. Identifying these signs can be difficult for a community of helpers that has limited psychological support knowhow. It can even be the case that interactions of volunteers or untrained aid workers can worse the trauma of a refugee. Humanity Crew specifically recounted the example of volunteers pressing refugees to retell their experience crossing the Mediterranean, even right after it had happened. This approach can often heighten the distress of the refugee. Problems with Interpreters: One group in particular that was mentioned were the translators / interpreters. Translators have a crucial role and are not only translating but rather act as co-therapists (“patients look to them first, not to the specialist”). Translators are most of the time also refugees or migrants. These poses two challenges. It can be very traumatic for them to relieve their experiences by translating for beneficiary. Or the interpreter might lack the relevant vocabulary and knowledge to work in a mental health environment. Unfortunately there have been complaints from the field by beneficiaries who have felt misrepresented by the translation. Selfcare amongst humanitarian aid workers and volunteers: was brought in the conversation after the mentioning from Velos of problems that volunteers have to deal such as that lack of experience in these kinds of situations and burnout which is very common between the volunteers. The importance of training for anyone working with refugees was repeated multiple times. While it can be difficult to implement psychological aid training for small organisations, there are ways to address this. Humanity Crew offer trainings for other organisations so partnering with another organisation can create economies of scale. Maria and Mary, who run dramatherapy works for refugees also offer them to aid workers as a way for them to face their own challenges before offering help to others. Beyond specialised trainings, any organisation can properly inform volunteers and staff on the different cultural background as well as the conflicts and dangers people have escaped or overcome in their journey and the lengthy legal procedures. This can inform their approach and encourage interactions with more understanding and patience. Finally, having daily or weekly debriefs with the team can help them discuss the different cases that they are working with and unburden them of some of the tension and second-hand trauma they might feel. It is of the utmost importance to advocate for a more positive approach of mental health support and make people understand what they can get from it to overcome their hesitations. However, psychological wellbeing can be fostered in many ways. Regardless of how focused an organisation is on mental health, focusing on building a community or providing opportunities for the community to express itself can make a huge contribution to people’s mental wellbeing. You should also be aware how multiple activities can build resilience, self-esteem, or a sense of normalcy back in people’s lives. All of these, as well as having tools to deal with situations when they become too intense, can make a difference in the lives of those recovering from trauma, dealing with the long waiting period of asylum or struggling with everyday survival.